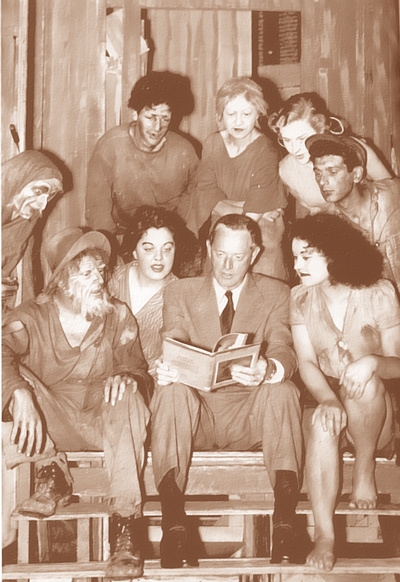 PHOTO: Erskine Caldwell, author of Tobacco Road, met the Vancouver cast in 1953. At his own expense, he came to testify at their censorhip trial. Most defendants were found guilty (of obscenity) but the case was overturned on appeal. The Crown appealed and one actor was found guilty. Erskine Preston Caldwell (December 17, 1903 - April 11, 1987) was an American author who mostly wrote about social problems in his native southern U.S. He drew the ire of some Southerners for exposing the racial and economic failings of the region with novels such as Tobacco Road and God's Little Acre. 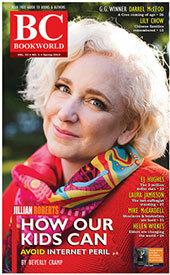 Tobacco Road was made into a successful play that was produced in Vancouver with dire consequences. Vancouver's Everyman Theatre had struggled financially from day one, in 1946, but by Christmas 1952 things were getting desperate. Susan McNicoll's history of mid-20th-century Canadian theatre, The Opening Act (Ronsdale 2012), describes how a Vancouver production of Tobacco Road by Everyman Theatre, directed by Dorothy Davies, led to the biggest censorship case for post-war theatre in Canada. "Tobacco Road was a Jack Kirkland adaptation of a novel with the same title by Erskine Caldwell,"; McNicoll recalls, "It opened on Broadway in New York to poor reviews in 1933. Censorship problems seemed a certainty with its gritty and earthy depiction of poor tenant farmers in Georgia. But the stark realism of the play eventually won over New York and played for more than 3,000 performances, a record at that time. It still ranks in the top 20 non-musical plays of all time on Broadway. The Niagara Barn Theatre staged the play in September 1951 and the International Players of Kingston in the late spring of 1952. The Everyman production in Vancouver opened to capacity crowds in January 1953. In those days if anyone filed a complaint against a certain show, the police would be obliged to send a couple of officers to view a performance. Officers attended the production on Wednesday, January 15, and the next morning Everyman received a warning from city police morality officers: clean up the production of Tobacco Road or close the doors. On the morning of January 17, city prosecutor Gordon Scott confirmed charges would be laid. The only questions left were who would be charged and when. "That night, police were standing by, waiting to arrest five of the cast members when the first act was over and the curtain came down, but the curtain never came down that night. "Faced with having to make the arrests on stage in front of some one thousand patrons, the police waited. During the second act the cast made entrances and exits through carefully calculated routes, thwarting the police in their efforts. While some actors were arrested and taken to the police station, patrons were given free coffee and there was impromptu entertainment with the help of two fellow actors in the audience-John Emerson and Bruno Gerussi. Close to midnight, those who had been arrested arrived back at the theatre to finish the third act. They were greeted with a screaming ovation from the audience, only a few of whom had left.